Money Smart Week is from Saturday, 3/30 to Saturday, 4/6. Improve your personal finance skills using this collection of books and ebooks. March is nationally recognized as Women's History Month, and CSUMB celebrates Womyn, Gender, & Justice Month by hosting events. For further information on related topics, the library recommends the following resources. Love Data Week is from Monday, 2/11 to Friday, 2/15. Upgrade your data skills with this collection of books and ebooks on data literacy and data analysis software. The CSUMB Library is committed to supporting diversity, inclusive excellence, equity, and social justice. The CSUMB Library is pleased to announce the winner of our Ethnic Studies Research Paper Award. Marisol Cruz, a CHHS major graduating in Spring 2018, has won the award for her paper “Filipino Americans: A health profile addressing health disparities and the effects of U.S. assimilation and discrimination.” Marisol wrote the winning paper for PH 407: Multicultural Health Education (3 units). The Farr Legacy Collection documents the public service careers of Congressman Sam Farr and his father, state Senator Fred Farr, and the impact of their work throughout the state of California and across the United States. Items on display include campaign materials, newspaper clippings, photographs, and correspondence for both Congressman Sam Farr and Senator Fred Farr, as well as photographs taken by Congressman Sam Farr during his congressional career. March is nationally recognized as Women's History Month, and CSUMB celebrates Womyn, Gender, and Justice Month by hosting events. For further information on related topics, the library recommends the following resources. The Ethnic Studies Research Paper Award is back for a second year! Students may submit a paper on an Ethnic Studies topic that they have written for any of their classes at CSUMB. The winner will be chosen in Spring 2018 and will receive a $500 prize. The first week of October is Mental Illness Awareness Week. The second week of October is Disability History Week. October is also National Disability Employment Awareness Month. This year's theme is "Inclusion Drives Innovation." 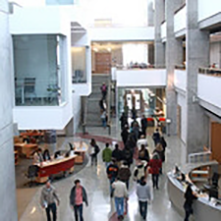 Find answers to questions commonly asked in the library. National Hispanic Heritage Month runs from September 15 to October 15 and recognizes the contributions of Latinos to U.S. culture. CSUMB celebrates by hosting Chican@/Latin@ Heritage Month events, some of which are listed along with library resources on related topics. Banned Books Week brings together the entire book community –- librarians, booksellers, publishers, journalists, teachers, and readers of all types –- in shared support of the freedom to seek and to express ideas, even those some consider unorthodox or unpopular. This year's Banned Books Week is celebrating diversity. November is Native American Heritage Month, and there will be a number of celebratory events at CSUMB. The books featured here are a few examples of what the library has to offer on related topics. November 14-20 is Trans* Awareness Week, and CSUMB will be hosting several events. The CSUMB Library offers the following suggestions for related reading. March is nationally recognized as Women's History Month, and CSUMB celebrates Womyn, Gender, & Justice Month by hosting a number of events. For further information on related topics, the library recommends these resources. The CSUMB Library is pleased to announce the winner of our Ethnic Studies Research Paper Award.